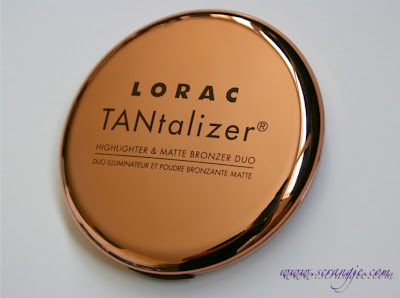 LORAC has a new TANtalizer bronzer palette out for Spring/Summer 2012 and it's enormous. 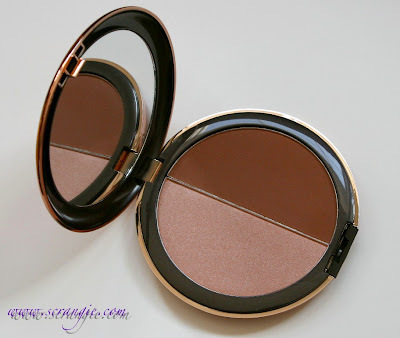 The size of this bronzer makes all my other blush compacts look so tiny in comparison! It's so big I could practically eat my dinner off of it. But the size is not important, really... I care most about the performance of the product. 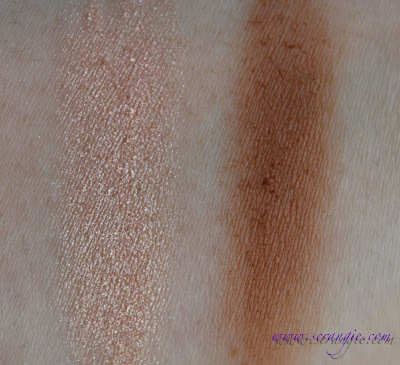 I absolutely adore the baked marbled TANtalizer that LORAC released a while back, so I had high hopes for this new one. The LORAC TANtalizer Highlighter and Matte Bronzer Duo comes in a large mirrored bronze compact. I wish I had included something in the photo for scale, but it's the largest blush compact in my drawer. It's four inches across, larger even than a Milani baked bronzer. Inside the compact is a full mirror and two large pans of product; highlighter on the left, bronzer on the right. The highlighter is a light, warm peach. It has a slight pinkness to it and a tiny bit of brown. The shimmer is fine and smooth, not chunky or glittery. 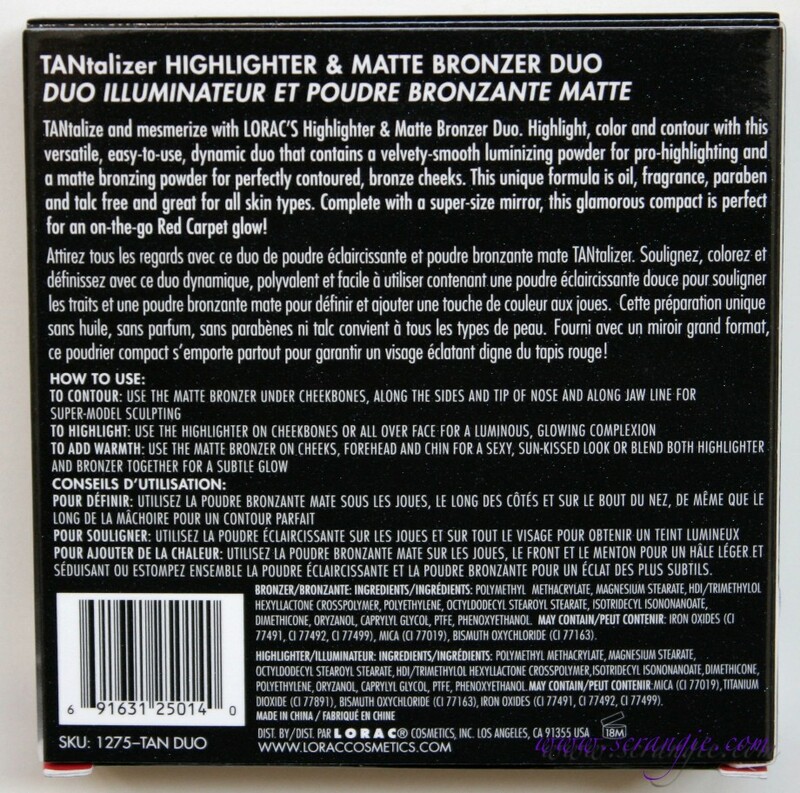 The bronzer half is a dark matte coffee brown. Swatches applied heavily, no primer, in natural light and with flash. 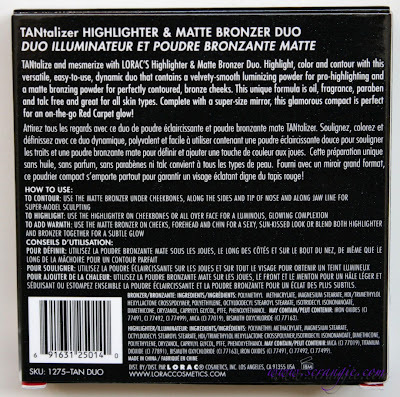 Ingredients are on the back of the box, but are not listed on the actual palette. 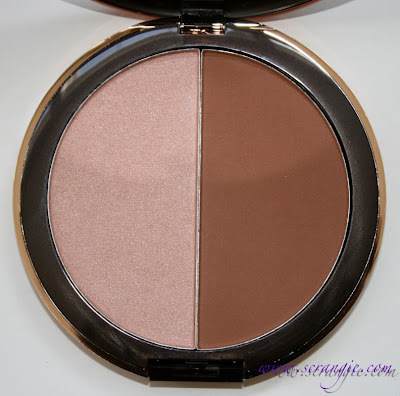 The bronzer seems intimidatingly dark, but it actually looks light and natural on my skin. It doesn't look orange or muddy, either. Just a nice, neutral brown. The highlighter isn't excessively frosty/silvery. Blends nicely. Very pretty packaging that stands out among my other bronzers. 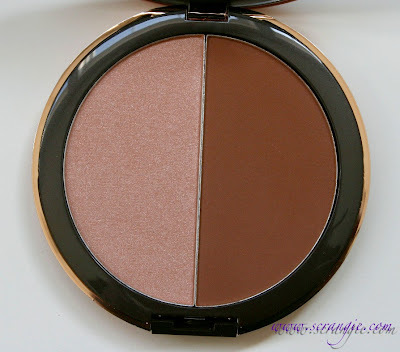 Very smooth, velvety, creamy powder texture on both the highlighter and the bronzer. Didn't make me break out. 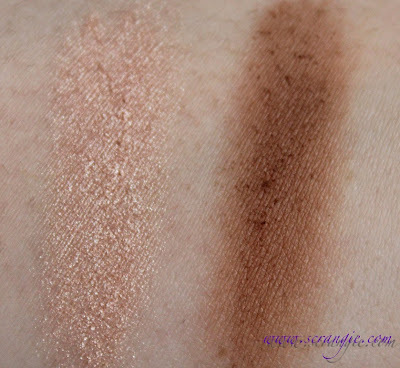 Both the highlighter and the bronzer make good eyeshadow colors, especially used together. Reasonable price considering how huge this product is. For comparison, my favorite Too Faced Sun Bunny bronzer is 0.33 oz and costs $29, this is 0.4oz and $32. Not bad at all. The large mirror in this is great. The size of the mirror should really help with on-the-go application since you can see your entire face in it. Reflective mirror-like compact collects scratches and fingerprints easily. Very large compact can be awkward to carry in a makeup bag or fit into a small drawer for storage. The highlighter looks too shiny if not blended carefully. When I use it to highlight my cheekbones, I need to use an extremely small amount of it and blend well for it not to look shiny/dewy. I'm happy to say that this new TANtalizer didn't disappoint me! I was kind of intimidated by the deep color of the bronzer, but once I tried it on, my fears dissipated. It is a little darker of a bronzer color than I'm used to, but it blends beautifully and doesn't look orange. I apply it lightly (with a small, dense brush) on and under my cheekbones and a little tiny bit up toward my temples and it looks very natural on my fair, cool skintone. I'm not a fan of the highlighter powder on my face (looks too shiny for me, accentuates rough skin areas) but it works great on the inner corners of my eyes, a little on my browbones, and a touch on my collarbone when I'm feeling fancy. 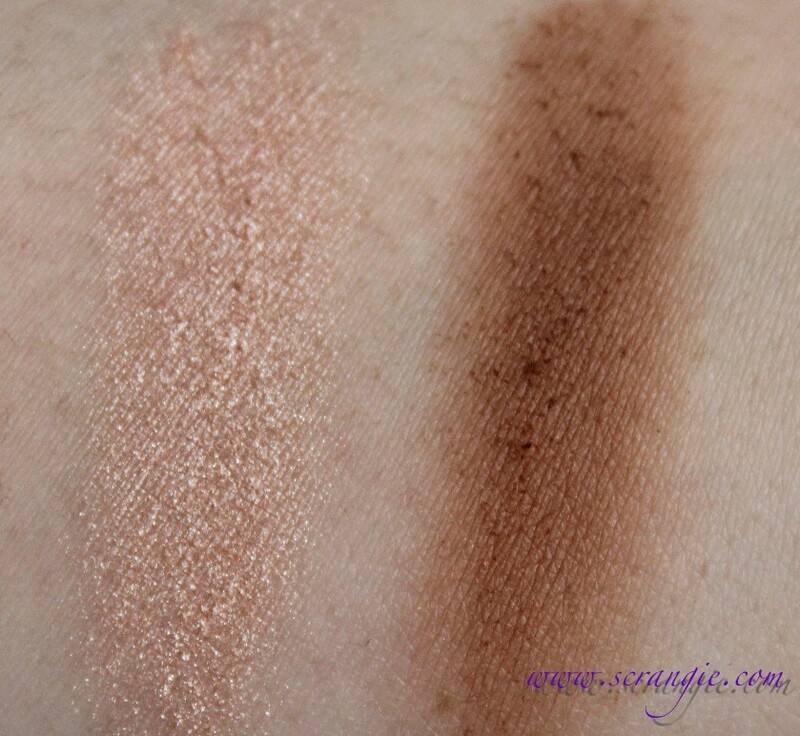 The texture of both is nice, they blend smoothly and they stay on without fading for a good long time. 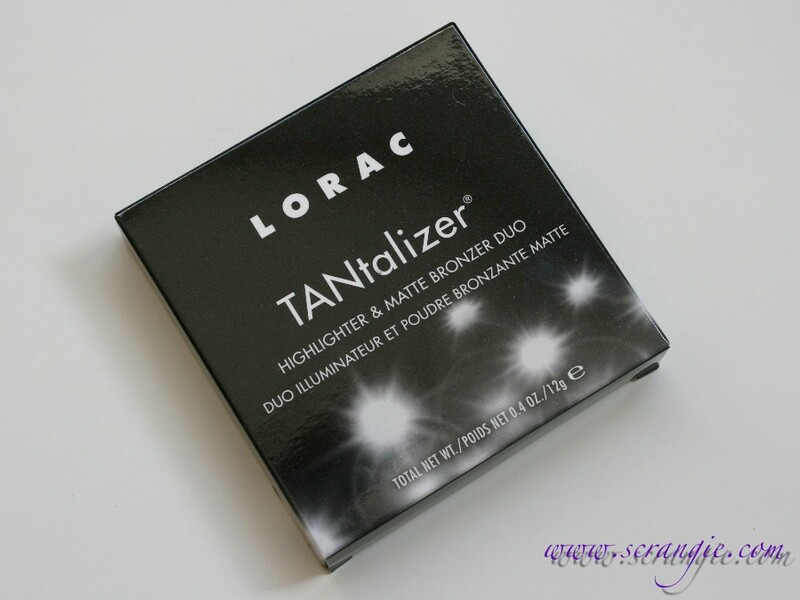 The LORAC TANtalizer Highlighter and Matte Bronzer duo is available now at Sephora. $32 for 0.4oz. Lorac has quickly become my go-to makeup line. Love this! Will have to check it out in store. It's very nice, definitely check it out when you get the chance! 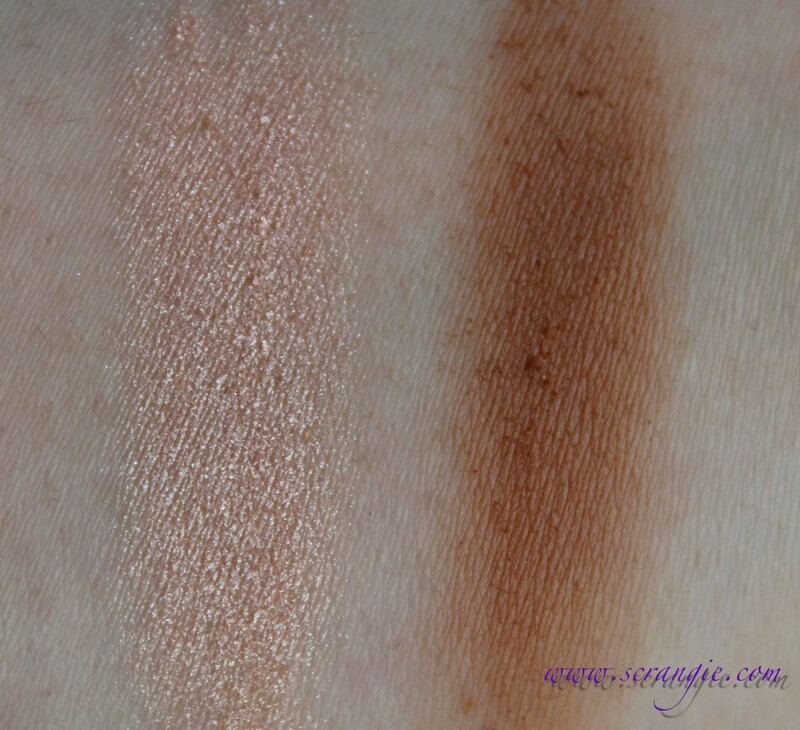 It seemed way too dark for me out of the pan, but once it was blended onto my cheekbones I loved it! Great review! I have Gosh's Giant Sun Powder, which is 30g or 1.1 oz, it is massive! WOW that is one dark bronzer! I love the concept of these combo palettes though.